This forum belongs to Bracken Lake. How Odd, I have asked Mark and await his reply. Are you sure FB, I have checked all the forum logs and it shows nothing as being deleted. Was it you FB who started the post. I started the Post Mark and if I hit view your posts it appears but not if I look in the Pools and Lakes section? Strange but not surprising it really is a magical place! I had the pleasure of being on the syndicate on Bracken, a most beautiful lake I will post some pictures when I can scan them, as far as I remember the whole syndicate and there was not many,fished the whole first week of the season, both my late brother John and me spent a great week together like 10 year olds laughing and cooking, we did fish but it was a hard water and I caught my only fish about 20 lbs on the last night, a stunning common as most of the redmire fish are. I had the chance to climb up THE tree and gauze on the carp cruising through the holes in the lilies, most in their 20's and 30's and every now and again you caught sight of a monster pushing them out the way ! EverY fish was recorded in the secret book and I am so happy my name is in there. I left the syndicate the following year, not having the time to justify the time, and I believe it may have been Chris Tarrant who was selected to take the spot. What wonderful memories of a perfect fishing lake and my brother. My best friends father was one of the original members of Brackens and my friend was allowed to fish with his dad. I remember tales from my friend when the Redmire fish arrived in 1973 and he caught one at 8lb on sweetcorn, his father also made a temporary pond in his garden which he used for growing on some fingerling carp that were placed into Brackens around the same time,I would often feed these fish with my friend dreaming of their final destination. Sadly my friends father died in 1974 and my friend never fished there again to my knowledge. We lost touch when I moved out of the area. I am retiring next year at 59 and would dearly love to join the syndicate, if anyone can help please PM me. I live very close to Bracken Lake and have walked past it many times catching glimpses of it through the woodland that lines its banks. I spent many years trying to find out as much as possible about the place and even managed eventually to speak to the head of the syndicate but it has never come to anything. Last year there seemed to be some work going on and I found the gates to the pool removed for a few weeks so naturally I had a little wander down to take a peek. Sure enough it is the pool of my dreams! ‘Can this lake’s carp rival Redmire’s’ was the banner headline blasting from the pages of Angling Times in early September 1957. The author of the piece was Albert Buckley (not the Albert Buckley of Mapperley fame), but another carp angler of note from Merstham, Surrey by the same name who was very active in carp fishing from the 1950s to the early 1980s. Buckley wrote, “What are the possibilities of a new carp record in the near future, and can any lake challenge the supremacy of Redmire Pool? One of them is Bracken Lake in Sussex. I firmly believe that in the near future Bracken will produce carp as large, if not larger, than Redmire. The lake is situated in a deep valley. On three sides the steep banks are covered with tall firs, aromatic pines and an occasional copper beech. It is so well protected that only the warm south winds blowing up the valley can ripple its usually placid surface. From sunrise to sunset at least four-fifths of the lake’s surface sparkle under the sun.” The carp themselves originally appeared to have been stocked after the last war in the late 1940s. 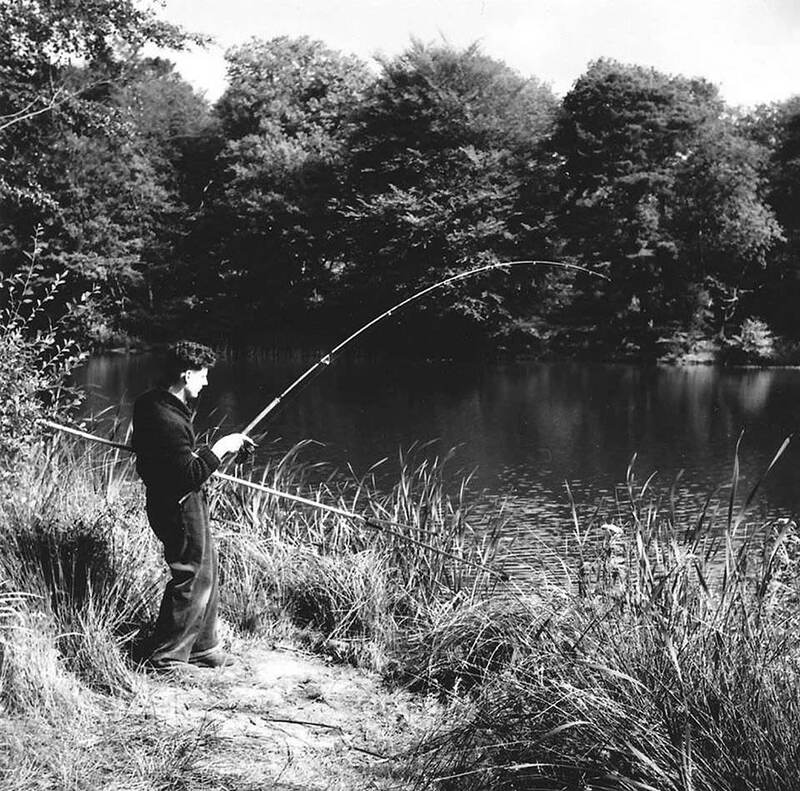 The potential started to be realised at the start of the 1957 season for two carp of 20lb plus were reported from Bracken. I was once lucky to walk around the fishery in the early 1970s with eminent angler and Bracken member John Nixon as my host. I remember the walk down the grassy slope, half way down the lake came into view and though the season was well under way not a soul was about. Indeed, it appeared to be a haven of peace and tranquillity. The water looked to be completely surrounded by trees, those on the east bank being particularly tall and dense. However, as we walked to the left the first swim we came to was on the west bank. It was from here that John banked in September 1957 a marvellous 20lb common. The July evening that John and I strolled around Bracken was calm with a warm sun and no cloud. The carp were evident in the north-west bay, long dark shapes lying at hap-hazard angles seemingly forming a criss-cross pattern in the water. We watched them for a while, every now and then a shiny bulk of shoulder revealed itself above the surface or maybe a part of the head of the fish would bob up making a perfectly formed circle of ripples that spread ever-widening taking several seconds to dissipate. Blimey, I thought, this place is fantastic. Once we’d travelling along the north-west bay the water became increasingly shallow and as we entered the north-east bay extensive weed beds were evident. The place seemed alive with carp and it was here that John suddenly grabbed my arm. “Look, just there...” I did and magically a common carp of considerable proportions floated by. It was a cracker, small head with a pronounced bump to it’s shoulders and, ‘as long as you like’. “That’s well over twenty pounds,” John whispered in my ear. Below:- An iconic image from yesteryear - MkIV split-cane rod, Mitchell reel and laminated cane carp landing net. John Nixon stuck fast into a 20lb common from Bracken Lake in September 1957.